Last week I was lucky enough to chat with the fabulous Will Evans, a Welsh cattle and hen farmer on his Rock and Roll Farming podcast. Unlike most of my media interviews, which are focus entirely on sustainability and have me spouting numbers like data is going out of fashion; this was a huge amount of fun and Will got me admitting to a celebrity crush, the fact that I have to put bacon and cheese on hot cross buns and the fact that, as an undergrad, I was so useless at presentations that even the lecturers felt sorry for me. So if you fancy listening to a fabulous Welsh accent (Will) and a slightly overexcited Oxford/Shropshire/Montana-hybrid (me) discussing the best types of cheese, beating cancer at 25 and the perils of being a reformed vegan in addition to the best way to ensure future livestock sustainability (hint: there’s no one-size-fits-all), check it out here. Commercial dairy cows in Cumbria – should they be “retired” before slaughter? Good grief. Just when I think I’ve heard it all, another food pundit comes up with an idea so daft that you could bottle it and sell it as vegan, gluten-free, dairy-free, humanely-reared organic water. The latest brainwave from Jamie Oliver is to “retire” old dairy cows onto pasture, where they can graze for four years before producing highly-marbled beef. Contrary to most of the breed-related marketing, Holstein beef is pretty good, so it’s a mouth-watering concept until we take a step back and think about the actual sustainability impacts. Producing beef from cull dairy cattle? Excellent idea. I once had a heated argument with an activist protestor outside the Smithsonian Museum in Washington DC who seemed surprised that, when he told me that most cull dairy cows end up as burgers, I didn’t renounce my heathen ways and immediately seek out the nearest tofu burrito. It makes perfect sense – where would be the logic in discarding an entire cow’s worth (~301 kg) of nutritious, delicious beef simply to bury, burn or use the meat for non-food purposes? Indeed, ~50% of the UK (and ~24% of the US) beef supply comes either from cull dairy cows or dairy calves reared for beef. Is there an argument for giving extra feed to cows that are going to be culled so that they get a little fatter and produce tastier beef? Yes indeed, adding value to cull dairy cows is a great idea, especially when the beef price is high. But here’s the rub. The average dairy cow in the U.K. is culled at 6.4 years of age. By that time she should have reached her mature weight, which means that the majority of extra weight she puts on in “retirement” is fat. Although we love the streaks of intramuscular fat that we see in a steak (marbling) and enjoy the depth of flavour that gives to the meat, the vast majority of fat on a carcass isn’t particularly edible. So we’re feeding a cow for four years of retirement in order to discard (or rather render into tallow – perhaps to make some £5 notes?) a significant proportion of the weight that she gains. A cow will eat 2-2.5% of her body weight in dry matter every single day. Four years of feeding a 700 kg cow = 4 x 365 days x 700 kg x 0.025 = 25,550 kg of feed dry matter, or 106,458 kg of fresh grass given that it’s only ~24% dry matter. Plus 4-years worth of drinking water, manure and greenhouse gas (GHG) emissions. A hefty environmental impact compared, for example, to rearing two beef steers on the same amount of pasture over a 4-year period, in addition to culling the dairy cow when she leaves the herd (sans retirement). That scenario would provide 200% more beef (~900 kg total, even allowing for the lighter weight for grass-finished vs. grain-fed steers) from the same amount of pasture and with a smaller total quantity of manure and GHG emissions because the growing animals are lighter in weight throughout, therefore excrete and emit less*. Just talked to a viewer of @jamieoliver‘s #freerangemilk prog. Take home: housed #dairy #cows equal welfare to battery hens. Appalling spin. I can’t decide whether the increasingly asinine proposals for sustainable food production propounded by Jamie Oliver’s “Friday Night Feast” programme, which recently left the casual viewer with the impression that welfare of housed dairy cows is equivalent to that of battery hens are serious, or simply a way to court fame through controversy. However, the number of tweets lauding the programme’s food philosophy is alarming given the amount of time devoted to non-sustainable ideology. Time for TV programmers to redress the balance with some Friday Night Facts vs. Fiction? This week I was asked to respond to an excellent Breakthrough article on the environmental impacts of beef production. As ever, I hope the comments below provide food for thought (pardon the pun) and I urge you to read the full Breakthrough article as well as the other comments by Jayson Lusk, Maureen Ogle and Alison van Eenennaam. Every food has an environmental impact, whether it’s cheeseburgers or tofu, coffee or corn. That shouldn’t come as a surprise to any of us and, as a scientist, sustainability consultant and parent, I don’t have a problem with food production being one of the biggest contributors to global environmental impacts. Why? Because food production is one of the few industries that are absolutely essential for human life. However, it’s clear that we need to take steps to reduce environmental impacts from human activity, and as such, the livestock industry is often criticised for both resource use and greenhouse gas (GHG) emissions. Although meat production is predicted to increase from now until at least 2050, it should be noted that the trends for improved productivity and efficiency within global livestock industries also reduce environmental impacts. As described in Marian Swain’s essay on meat production, the US beef industry cut resource use and greenhouse emissions considerably between 1977 and 2007. Meanwhile, the rise of modern feedlot-finishing systems cuts land use, water use, and emissions per unit of beef compared to grass-finished meat. These findings may seem intuitively incorrect as we’re constantly exposed to marketing and media messages suggesting that only grass-fed meats are environmentally sustainable, and that intensive livestock systems are undesirable. The data speak for themselves however—the majority of extensive systems finish cattle at lighter weights (thus requiring more total animals to maintain beef supply), have lower growth rates (so cattle take longer to grow to their finish weight) and often have lower reproductive performance in female cattle. All these factors combine to increase environmental impacts. But when I presented this data to a group of French Masters-level Livestock Engineering students earlier this month, they were (in their own words) shocked. Even among experts and students, there remains a great deal of misunderstandings when it comes to meat production. Does this mean that every beef producer worldwide should embrace feedlot-finishing and reduce pasture use? Absolutely not. One of the major benefits of cattle compared to swine and poultry is that they digest and use human-inedible forages, such that dairy and grass-fed beef cattle actually produce more human-edible protein in the form of milk and meat than they consume; and feedlot-finished beef cattle have a ratio of human-edible feed intake to human-edible protein output similar to that of swine, despite their greater overall land use. In keeping with the themes discussed in the Swain’s essay, there is no magic bullet—it is essential to fit production systems to the cattle, climate, market, and culture within each region and to improve productivity within each and every system. So rather than reducing animal protein consumption as we move towards 2050, we might ponder keeping total consumption relatively stable, with a more equitable distribution across the globe? This would allow for a decrease in over-consumption in high-income regions, while providing a greater quantity of milk, meat, and eggs to those who have dire need for adequate animal proteins to maintain health and to promote adequate child growth and development. While the environmental impact of beef production is a key concern, we also have to examine the role of livestock in economic and social sustainability. For billions of small-scale farmers, cattle provideeconomic viability, improved nutrition, social status and a means to diversify agricultural production as well as tangible benefits in terms of fertilizer, hides and other by-products. Should we insist that global beef production is abandoned in favour of increased legumes, nuts or lab-created proteins? No. We simply need to give producers worldwide the education, tools and technologies to make the best and most efficient use of their resources. Only then will we have a truly sustainable (environmentally responsible, economically viable and socially acceptable) global meat industry. Having Your Beef and Spending It? Don’t Let Moral Indignation Overcome Common Sense. My Twitter feed has lit up like a firework this week with the news that cows are being murdered to produce the new plastic British £5 notes. Or, to correct the sensationalism with science, the notes contain a trace of tallow in the polymer that’s used to make them. Tallow is a by-product of beef production – it’s effectively the fat on the animal that we don’t want to eat, and has been used for centuries in a myriad of products. Let’s be very clear here. No cows are being slaughtered (murdered!) to make £5 notes. Cattle are either slaughtered for meat or euthanised due to illness – there are no Bank of England-sanctioned posses stringing up helpless cattle as a license to print money (literally). Fortunately, we are able to use the portion of the animal’s carcass that we can’t (or won’t) eat to manufacture products that would otherwise rely on synthetic chemicals. Not surprisingly, the majority of the outcry has come from vegetarians and vegans. While I will defend the right of anybody to choose what they eat or wear (note that I am not criticising or denouncing anybody’s religious beliefs here), the current protests seem to be slanted towards choosing to be offended by a minor point, rather than any semblance of logic. According to a rather nifty (yet accurate) calculation by the guys at Vice, it would take 23 kg of tallow to make all the new £5 notes that will be in circulation by the time the old ones are phased out. The total tallow yield per animal is ~40 kg, so it would take just over half of one animal (23/40 = 0.58) to produce all the tallow for the UK’s total £5 note requirements. Many of those who are protesting are vegetarian (as opposed to vegan), thus still consume milk, eggs, honey and other non-meat animal products. Given that 20% or more of the cattle slaughtered in the UK are adult cows and bulls (i.e. they have reached the end of their productive life in the dairy or beef herd rather than being specifically reared for meat), it makes sense to utilise whatever components of their carcasses are suitable for industrial purposes rather than diverting them into landfill or incinerators. If dairy consumption is acceptable to vegetarians, can it really be claimed that bank notes containing a fraction of the spent dairy cow’s carcass as tallow are not? As I have mentioned in previous blog posts, myriad everyday products contain by-products from cattle. Given the current outcry, once can only assume that those who shun the new £5 notes also refuse to travel in cars, buses or on bicycles (as (t(as tyres contain stearic acid, again from tallow); do not drink from bone china mugs; or disavow beer filtered through isinglass. Or, as with so many other issues, is it an opportunity for a small minority to protest and promote their personal dietary choices behind the guise of population-wide offence? The online petition against the new £5 notes currently has >129,000 signatures. Obviously we all have the right to protest against issues that alarm, anger or offend us, and social media gives those opinions far greater weight than we had in the past. Yet is this really an issue that is more important (as judged by media coverage) than 11-year-old girls being forced into marriage? Or livestock being slaughtered without first being stunned? Or asylum seekers being refused entry? Perhaps in this case, the moral minority need to examine the bigger picture, and consider the issues that really matter. Where’s the Beef? Not in Danish Diets. For those of us in the UK, mentioning Danish livestock production almost inevitably leads to thoughts of Danish bacon (be still my beating heart) – a considerable proportion of their 90% of domestic pork products that are exported. However, any beef lovers in Denmark may be in trouble, as recent news articles suggest that red meat (beginning with beef) will soon be taxed in order to cut consumption and meet greenhouse gas targets. Despite the number of voices clamouring for reduced meat consumption, it seems clear that the average consumer isn’t going to forgo meat and dairy simply because a new study is publicised in the lay press. I’m firmly of the opinion that the only way that meat consumption will decline is if it becomes too expensive to include in the weekly shopping basket. Indeed, although meat consumption per capita has declined in the USA over the past 10 years, demand (as measured by the price that the consumer is willing to pay) has increased over recent years. So will taxing meat lead to a reduction in consumption? For those who routinely order a 16 oz (454 g) steak in a restaurant or think nothing of tucking into a chateaubriand, probably not. High end cuts of beef are associated with celebrations and luxury dining, and going out for a broccoli pasta bake just doesn’t have that same ring to it. However, we live in a world where 793 million people (10.7 % of the global population) are undernourished – and that isn’t simply confined to people in developing regions. That means that almost 1 in 9 people do not have enough food. To low-income consumers, food availability isn’t simply a function of what is on the shelf in the supermarket, it’s directly related to economic cost and convenience. If red meat is taxed, it will still be eaten, but there will be a disproportionate shift towards consumers with a greater income and away from those who are in most need of affordable high-quality protein, including growing children. Do beef alternatives exist? Absolutely – protein can be supplied from other meats, fish or vegetable-based foods. Yet here’s where the convenience aspect comes in – most of us can probably think of a quick and easy recipe involving beef, but how many can you think of involving tofu or lentils? That’s not to say that we shouldn’t expand our cooking repertoires, but when time is at a premium, quick easy recipes that will feed a family win every time. If beef becomes unaffordable, it will have to be replaced by another protein – but this substitution does not occur at zero cost. 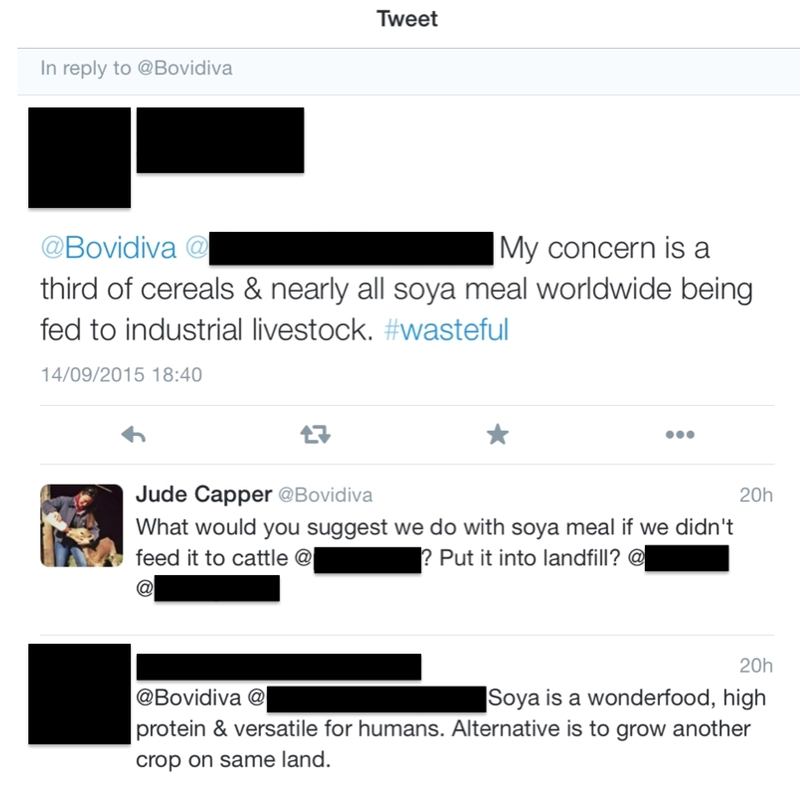 Can tofu or lentils be produced on low-quality pastureland where we can’t grow other human food or fibre crops? Do pork or poultry make such efficient use of forages, pastures and by-products from human food and fibre production that, far from competing with humans for food, the animals produce more human-edible energy or protein than they consume? No. The only livestock that do this are those pesky greenhouse gas-belching bovines. Greenhouse gases are important, but they are not the only factor that we should consider when advocating for sustainable dietary choices. In a world where millions of people are food-insecure, removing a protein choice from the table of those with low incomes simply adds to the problem of how to feed the world – sustainably. 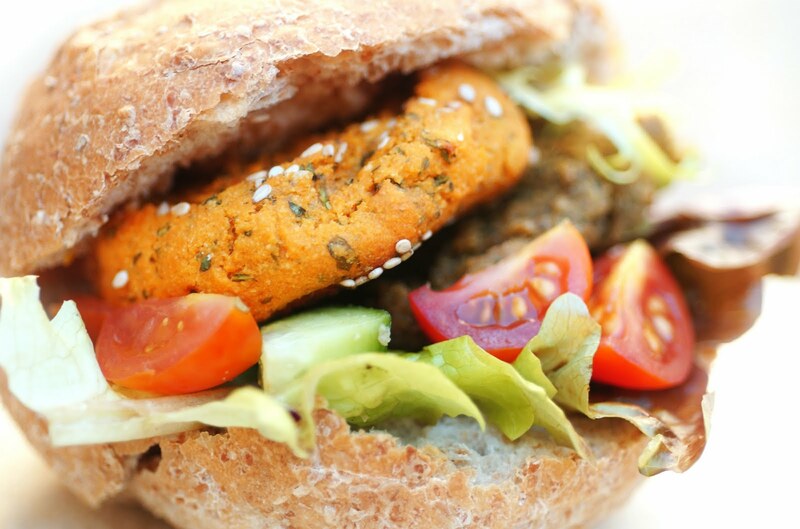 The Paradox of the Roasted Vegetable Sandwich – Do We Eat What We Preach? So here’s the question: who has been out to eat with friends, family or work colleagues, ordered what’s perceived as a virtuous (low-fat, high-fibre, gluten-free or vegetarian) meal in a restaurant, and then grabbed a Snickers bar on the way home? Or, when completing a survey, stated that you are highly concerned about animal welfare or environmental issues, then gone to the grocery store and chosen food simply based on price, taste and convenience? I’d suggest that this is a situation common to most of us – the behaviours and image that we present to the world (including our carefully-posed selfies) do not always reveal our real personality. Which brings me to the paradox of the roasted vegetable sandwich. Yesterday, a friend complained that as a consequence of being last in the lunch line at a conference, all that was left was a “soggy veggie sandwich.” Now I attend a lot of meetings and conferences, many of which serve sandwiches, and despite being a voracious meat eater, I’ll almost always choose the vegetarian sandwich. I love egg, hummus or roasted vegetables and really hate slimy catering mayonnaise tainting the deliciousness of roast beef or ham. Luckily for me, in my experience any sandwiches left after the initial rush are inevitably vegetarian or vegan. Obviously my view may be biased in that I attend far more meetings with a farmer or agricultural industry audience than those attended by, say, Hollywood actors or animal rights activists. But given the number of untouched meatless sandwiches, are caterers overcatering for vegetarians and vegans in an attempt to be sensitive to diverse dietary requirements; or do survey results indicating that people intend to cut meat consumption vastly overestimate the extent to which this is actually happening? Do many people who claim to be vegetarian or vegan actually eat mostly plant-based foods (Hello Beyoncé!) with the occasional hamburger? We are inundated with messages suggesting that meat is a socially-irresponsible choice. That Meatless Mondays are wildly popular and an increasing number of people are turning to vegetarian and vegan diets to improve their health, animal welfare or environmental impact. Indeed, one UK study of the sandwiches available in grocery stores and fast food restaurants showed that less than 3% were plant-based, and suggested that this was a significant problem for the (alleged) 35% of people who are willing to cut their meat consumption. Yet if over a third of the population were really determined to cut meat intake, wouldn’t that demand have filtered back to sandwich retailers? Despite stated consumer interest in buying earth-friendly or high-welfare products, interest seldom translates into real-life buying behaviours. Those opposed to livestock farming often state that we could feed the world (political, social and infrastructural barriers not withstanding) if we all adopted a vegetarian or vegan diet, but it seems that we simply don’t want to. Could we give up growing crops for animal feed and feed more people with tofu and Quorn? Absolutely. Yet there’s a huge gap between philosophical ideology and real world behaviour. Rather than bewailing the allegation that one-third of global grain crops are fed to livestock (ignoring the fact that a high proportion consists of human-inedible byproducts from cereal crops grown for human use), perhaps it’s time to celebrate the fact that two-thirds of global cereals are used to feed people, without being made to feel guilty for enjoying a roast beef sandwich (no mayo please). Am I missing something, or have words ceased to have any meaning? Take the phrase “nut cheese”. Seriously. Now stop giggling like a 12-year old and actually think about it. Would you buy some nut cheese for your grilled cheese sandwich? Fancy some nut cheese on your pizza? Actually, purely from a practical point of view, no, you wouldn’t. Nut cheeses don’t really melt, they are better for spreading on crackers. 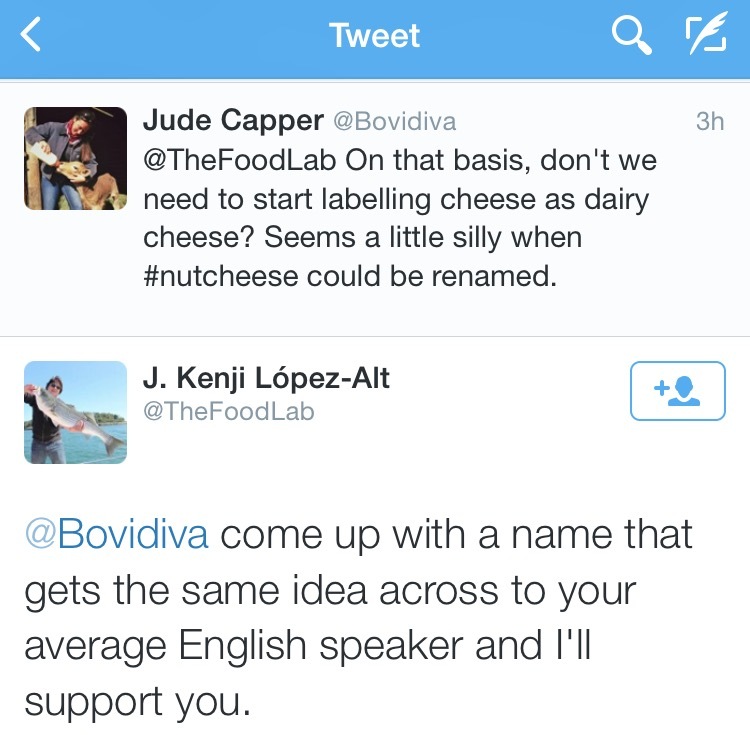 But, leaving the double entendres aside, why would we give Edam (sorry…) about nut cheese? Apparently it’s a product that’s made exactly like cheese, if you ignore the fact that (dairy)* milk doesn’t have to be ground with water to separate the solids before the cheesemaking begins. Oh, and the fact that nut cheese made from nuts. Which means that despite the name, it’s not actually cheese. Why does the concept of nut “cheese” irritate me so? It’s not paranoia that everybody will become so enamoured by nut cheese that the dairy industry will cease to exist (could a non-melting, spreading cheese really compete with a hefty chunk of Wensleydale? ); or the suspicion that it’s a dastardly plot to infiltrate nut cheese into our children’s diets and tempt them away from the wonderful world of extra strong Cheddar and ashed-rind goats cheese. It’s simply because it’s yet another fake food. Believe me, I get equally irritated by soy “milk”; orange-colored soft drinks masquerading as “juice” (ahem, Sunny-D); and burgers made of mashed tofu. Why? Because I don’t see the point of plastic fantastic meals. Yes, I’ve eaten vegan cheese, vegetarian sausages and tofu roasts. I ate them when I was vegan** and I felt hypocritical for doing so even then. No, they didn’t taste better than the “real” thing (although one soy ice-cream was amazingly good). No, I couldn’t believe I was tucking into a juicy hot dog when I was simply chewing on something with all the taste and texture of reconstituted shoe leather. No, they didn’t compensate for my brothers gleefully eating bacon sandwiches. They simply seemed like a poor imitation of the diet that I had previously enjoyed as an omnivore. When I was vegan I loved vegetables, and I still do now as a happy omnivore. I may lose my beef-loving credentials for admitting this, but after presenting a webinar on beef sustainability yesterday, I prepared and ate an entirely vegan meal. Admittedly I didn’t notice that it was vegan until I was chatting with @MomattheMeatCounter afterwards, but more tellingly, I didn’t miss the meat. I love vegetables because they are fabulously diverse. They have a myriad of flavours and textures that no other foods can provide. I could happily eat that same vegan meal two or three times per week. Yet vegetables aren’t meat or dairy, they don’t provide the same flavours and nutrients, and I couldn’t go back to being vegan. Aside from anything else, I’d miss real bacon cheeseburgers. Which brings me to my major issue with all faux meats and dairy products. If you’re determined to give up animal proteins for ethical reasons, then why eat an ersatz version? Why not celebrate the fabulousness of fruit and vegetables and cook creative plant-based meals rather than eating a make-believe version of an animal-based food? 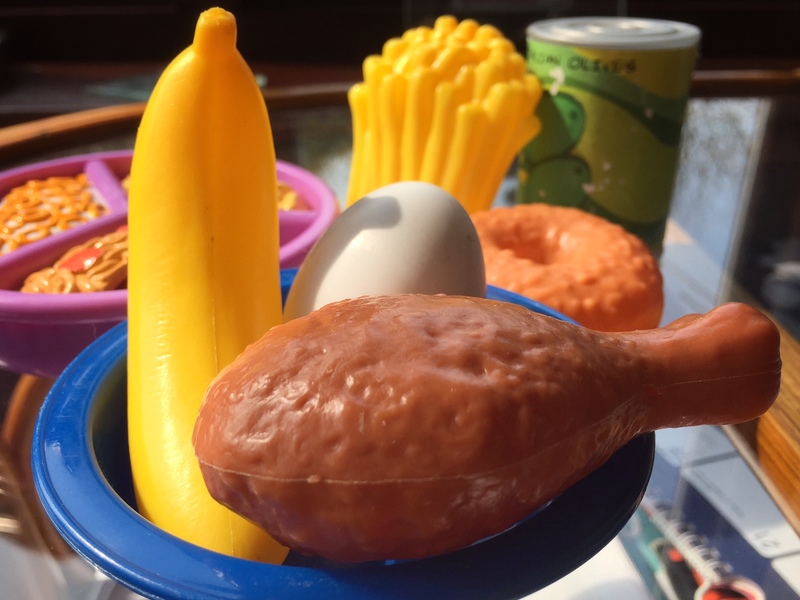 Why are these faux foods often championed by people who otherwise derive their careers from bleating about “natural” foods and telling us that if a third-grader can’t pronounce it, we shouldn’t eat it? Why are millions being invested in the promise of growing meat in labs or turning pea protein into faux eggs when we could simply eat peas instead? Believe me, if I ever have the misfortune to become intolerant to gluten or dairy, I will be seeking real (and naturally gluten and dairy-free!) eggs at Easter rather than a faux chocolate egg with all the supposedly sinful ingredients removed***. 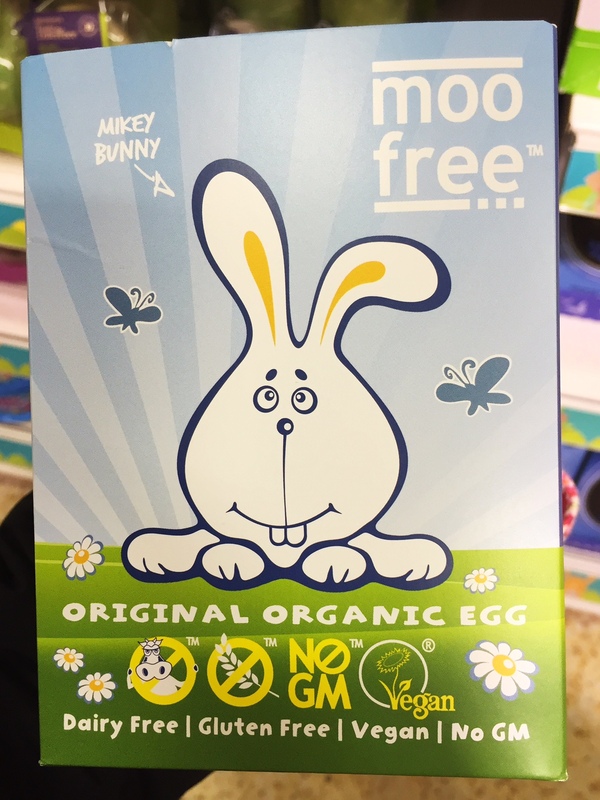 Yet this treat was next to the regular chocolate eggs in the supermarket this weekend. A great thing for the small proportion of people who actually have dairy or gluten allergies, but also a clever Easter guilt-inducer to parents everywhere who are convinced that little Crispin and Arabella’s blood chemical levels will otherwise reach “toxic” limits akin to being given an intravenous infusion of the self-proclaimed Food Babe’s nemesis, Starbucks’ Pumpkin Spice Latte. Maybe I’m pedantic, overly irritable about the appropriation of words that are specific to certain foods. Perhaps my European roots run too deeply – after all, I come from a country that designates Stilton cheese as only being produced from milk from cows grazed in three specific counties. Yet it seems like a lazy excuse to suggest that if nut cheese isn’t called cheese it will languish uneaten in the supermarket for months because nobody will understand what it is. In a world where new words are invented every single day (please don’t get my Mother started on the validity of the word “webinar”) is it really conceivable to suggest that marketers can’t find an alternative to “cheese” or “milk” to describe plant-based foods? After all, nobody tries to call tofu “meat”…..yet. Perhaps that will be the next label on the faux food buffet table? I’m sorry, but I Camembert it. *Even typing (dairy) as a modifier before milk raises my blood pressure a few points. **I was a strict vegan for 12 months when I was 15. When I was 16 I resumed eating bacon as if pigs were going out of fashion. I still enjoy vegetarian or vegan meals, but I’ve never looked back. ***Yes, I have eaten milk-free milk chocolate – it could easily be used as a substitute for candle wax.